War of the Roses does not look much like the paintings of the real War of the Roses . In the paintings, everyone has lined up neatly to take turns sticking lances and arrows into each other's faces. Maybe that's how it actually went down -- I don't know what happened on those soggy English fields -- but I imagine parts may have looked a little like the game: herds of lopsided footmen crashing into each other, recklessly heaving blades to and fro while archers struggle to hit the right-colored roses. 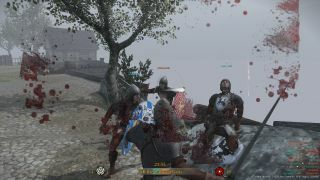 Fatshark and Paradox's multiplayer medieval warfare game is not easy. The closed beta began last week, and like many other new players, I do a lot of spinning, swinging at nothing, and getting stabbed in the face. But I'm getting better, and I've familiarized myself with the four class presets: footman, crossbowman, longbowman, and footknight. See how I fared with each in the video above. The footman is the first available class, and for a few rounds I fight like I'm swatting at a bee in a dark room. I swing erratically and stumble in circles hoping someone will accidentally run throat-first into my sword. I'm a berserk sword monster. Eventually I learn how to time my strikes with the rhythm of my opponent. I still miss a lot, but at least my attacks aren't random. I also learn how to charge forward for a bash attack, but wind up smacking into friendlies as often as enemies. I hit my teammates a lot, actually...they should duck more. When I unlock the crossbowman class, I decide it might be safer for everyone if I back away from the sword-swinging game. The crossbow is easier to wield, but requires just as much patience and precision. Reloading is very slow. It's faster if I hit the spinning notches with my left mouse button, but still slow. Each shot must be careful, and one shot doesn't influence the next. Even if anyone actually stood still long enough to shoot at twice, I can't tell where my arrows are going unless I hit someone. When I do hit someone, my arrows usually go "tink" off of their armor, and I see a blue number. It's nice when a yellow number lets me know I struck flesh. When a swordsman lumbers toward me, the scene completely diverges from those medieval paintings. I don't stand to face him, crossbow raised. I turn and run. I might slice him up with my secondary sword, but it's more likely that he'll trample me, and trying to hit him with a crossbow bolt is a terrible idea when I only have one shot before a long vulnerable reload. With the longbow, there's no more slow cranking reload, but my arrows follow a much more dramatic parabola. I can see where they're going a little better, at least, and when I'm brave enough to approach the battle, I can admire my hard work: the feathered tips sticking out of my enemies' arms, legs, and heads. I've found that the best tactic is to wait for the enemy to bunch up before rapidly dealing out a barrage arrows. Bunching is especially common in Conquest mode, where players gather around a flag to capture it, and that's when I get most of my arrow kills. It's not how I like to get kills, though. Shooting into packs is effective, but I much prefer the satisfaction of a good shot. Sticking a mounted knight as he gallops across a field is the best scene in the archetypal medieval war movie I'm playing out in my head. I wish I could see my arrow's trajectory just a little more clearly, but other than that, it's the class for me. I especially love the sound effects: the creak of the tensing bow and the thwack of a freed arrow. The final class preset is better armored than the others, but lacks a shield. His longsword can be nasty, but he often loses to custom classes with polearms, which are annoyingly deadly. As with the footman, I'm circling and side swiping, often missing or clanging off of armor. It may be telling that my favorite classes, the longbowman and crossbowman, are the most analogous to the first-person shooter experience. The translation of free-form swordplay to a mouse and keyboard is much trickier to master than the ubiquitous shooter convention. It might be simpler if everyone stood in a line like the paintings tell us they're supposed to, but instead I'm trying to swipe and stab moving targets while circle-strafing. It takes a lot of patience to learn how to reliably land strikes, but it is possible -- other beta players are already proving that. War of the Roses releases October 2, and $30 pre-orders became available today. The beta build is as rough as the learning curve -- it sometimes refuses to refresh the server list, for example -- and the interface isn't especially slick, but it's being updated regularly and may look different at launch. With the Mount & Blade series and the upcoming standalone Chivalry: Medieval Warfare , the relatively small medieval combat genre is planting firmer roots in PC gaming. As a sufferer of gun fatigue, I support this trend.